A few weeks back I noted an interesting video I had caught describing how to create a quill pen. My plan was to keep an eye out for natural materials that would let me recreate this same experiment. Instead of finding just the right tail feather, I found this sweet deal at Staples. 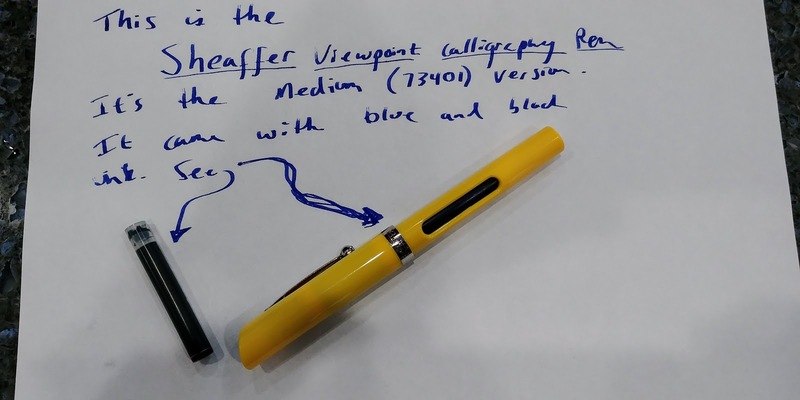 For $5.99, I picked up a Sheaffer Calligraphy Fountain Pen Viewpoint, which had the same nib style as the quill pen that was hand carved in the video. That would give me the chance to play with granddaddy of pen types, all while avoiding the bird flu. Staples offers a Medium, Fine and Broad version of the pen, on a whim, I picked up the Medium version. Using a fountain pen is like shaving with a safety razor. Intimidating, steeped in tradition, and yet ultimately nearly the same as using a modern device. I hadn't plan to get into fountain pens, but the Staples deal was too good to pass up. Once I got the pen home, I hit my first challenge: how do you assemble this guy? It's obvious how the pen screws together, but what was less obvious to me is which direction the cartridge loaded. If you look at the ink cartridge, you'll see that there's one side that has a small bubble, and the other has a larger indentation. With a bit of research, I learned that the bubble side goes towards the pen tip. I assembled the pen and then waited for ink to gush all over my hands. That didn't happen. Now the next challenge: how do you write with this guy? The Internet has this answer of course. The bottom line is that you need to position the pen tip at the right angle, and apply gentle pressure to cause the ink to flow. As a $6 dollar experiment, I'd say these pens are an absolute hit. They're just plain fun. I doubt I'm going to give up my Pilot Gel's anytime soon, but for a novel writing experience, you really can't beat this pen. Next time I'm at Staples, I plan to pick up the Fine and Broad versions.